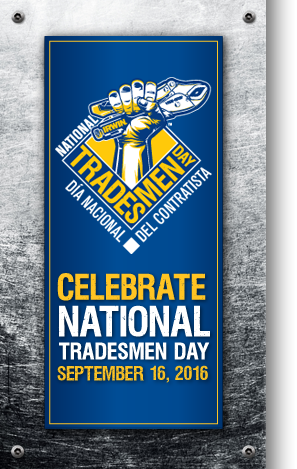 Friday, September 16th, was National Tradesmen Day. A day, started in 2012, to bring awareness to the plight of the tradesman. I’d like to share a few thoughts on the men and women who make up our contemporary tradesmen. To the unsung heroes who work in physically demanding conditions for long hours, often overlooked by the humans they are serving. People who have, consciously or by circumstance, devoted their careers to turning raw materials into the products, homes and structures we need to live and do commerce. Within the ranks of the tradesman, there has long been a decline in availability of fresh bodies and minds to carry the torch of knowledge on to the next generation. In the past, knowledge was passed along on the job site. One such program, the Compagnons du Tour de France, dates back to the middle ages. Apprentices live in communal housing, work alongside master craftsmen, and attend formal class training into the evening and on weekends. It was and is a demanding lifestyle, producing the finest tradesmen, who were and are looked up to by their countrymen. In recent decades, a hyper focus was placed on high school graduates going to college for a degree before entering the workforce. College education has produced many fine scholars, many of whom struggle to find work in their field of study. The crushing debt accumulated takes many years to pay down, during their entry level employment. That debt forces many to make tough life decisions regarding, travel, homeownership and starting a family. Don’t get me wrong, I feel the benefits of a traditional college setting pay back big dividends in broadened horizons and new opportunities. Simply said, “we don’t know what we don’t know” and college helps us figure that out. It’s just not a good fit for everyone. Working in the trades helped me work that out while earning a living. I am a life-long-learner, and have attended countless seminars, conferences, and adult education courses. It’s what worked for me. There are accredited technical schools at the secondary and post secondary level. Blackstone Valley Tech, locally, and Universal Technical Institute UTI.edu are one of each. So keep this in mind when you are pondering your kid’s future, or your own. There are many moving parts to becoming an accomplished tradesman. It is a challenging, often unconventional lifestyle, that rewards us with an honest living and tangible accomplishments of many types. Please encourage more young and not so young men and women to consider it as a career.